Lehigh Valley, Pa. — After scoring the game-winning goal with just 0.5 seconds remaining in regulation to give the Lehigh Valley Phantoms a 4-3 victory over the Toronto Marlies in Saturday night’s contest and tallying two total points on the week in three contests, Lehigh Valley Phantoms forward Chris Conner has been named the PSECU Player of the Week. The Lehigh Valley Phantoms capped off their five-game home stand this past Saturday night with a dramatic 4-3 victory over the Toronto Marlies inside of PPL Center. After both Toronto’s Tanner MacMaster and Lehigh Valley’s Tyrell Goulbourne found the back of the net in the opening 20 minutes of play, the Phantoms and Marlies remained tied, 1-1, after a scoreless second period. From there, the two teams would see-saw back and forth to the point of 3-3 when the Marlies knotted the game up at the 18:03 mark of the third period. With time winding down, and the Phantoms on a power play, David Schlemko rushed the puck up the ice and into the Toronto zone before dishing it over to Mike Vecchione who, in turn, sent it to Connor Bunnaman. With just seconds remaining in the contest, Bunnaman sent a pass over to Conner who kicked it from his skate to his stick and promptly deposited the puck into the net with just 0.5 seconds remaining in the final frame to give the Phantoms a 4-3 lead, and subsequent win, over the Marlies. 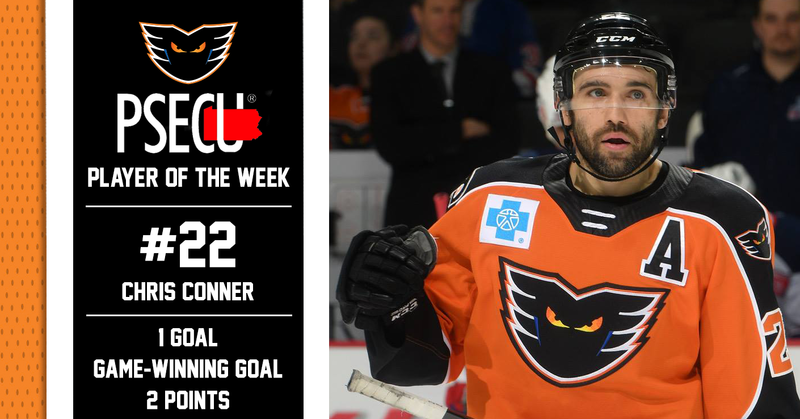 The goal marked Conner’s 13th of the 2018-19 season and his second point of the week after tallying an assist in Friday night’s game against the Providence Bruins. Overall, the 13th-year professional now has 41 points (13G-28A) in 60 tilts this season. With the last-second, dramatic win, the Orange and Black completed the season sweep of the Marlies as they had previously defeated them in Toronto, 5-2, back on December 2.